Having a radio control car or cars is a bit like family entertainment, it’s not just fun for one but for everyone that gets involved. 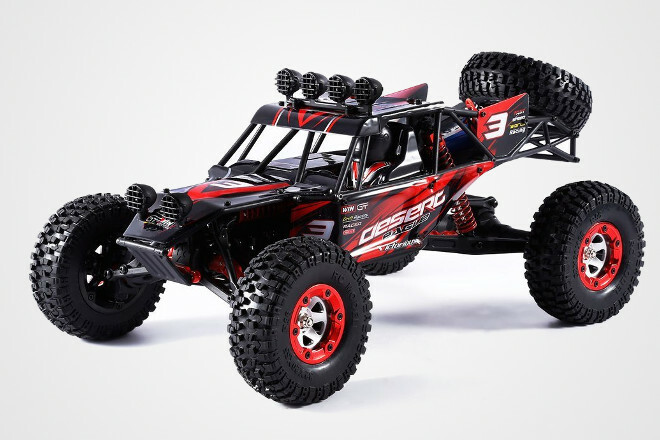 While most RC cars, toys and hobby grade, will give you some experience, buying the right one makes the difference between a good or bad experience. To help make it a good one I’ve assembled a list of 10 various types of radio control vehicles that will get you looking in the right direction. Beginners need to learn the basics first and once you have them under control you will also naturally have a good idea which way you want to expand your skills. These could be racing, drifting, off-road, on-road or a little of everything. Just be warned this RC hobby can be very addictive. Are you wondering what the difference is between toy grade and hobby grade radio control cars? You can get up to speed over at Wikipedia. For many prospective buyers Amazon is the go-to-place but in many cases if you don’t live in one of the main regions shipping is not offered. Amazon is not the only online store, it maybe king, but there are plenty of other places to get great deals. 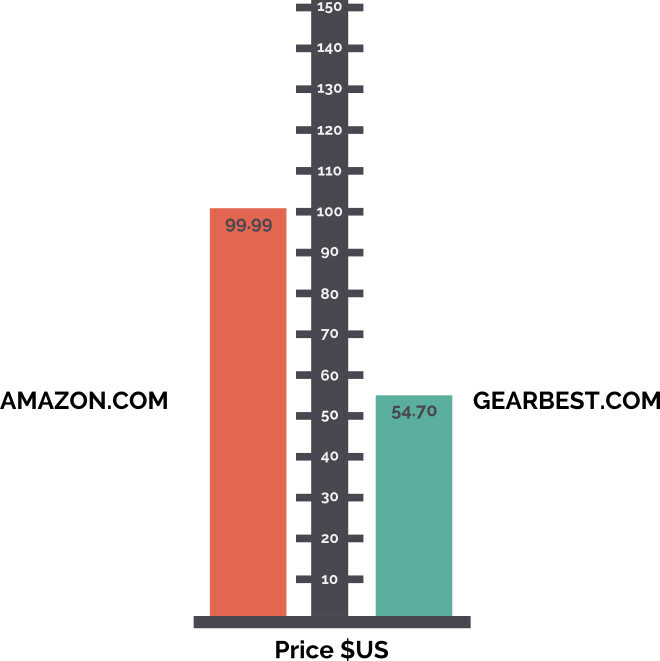 Gear Best is Chinese online seller of many products. I chose them because they have a star rating and review set up similar to Amazon. This makes it simple to compare products, in this case radio control cars. Below each RC car you will see some comparison points and a price chart (chart will enlarge if clicked on). 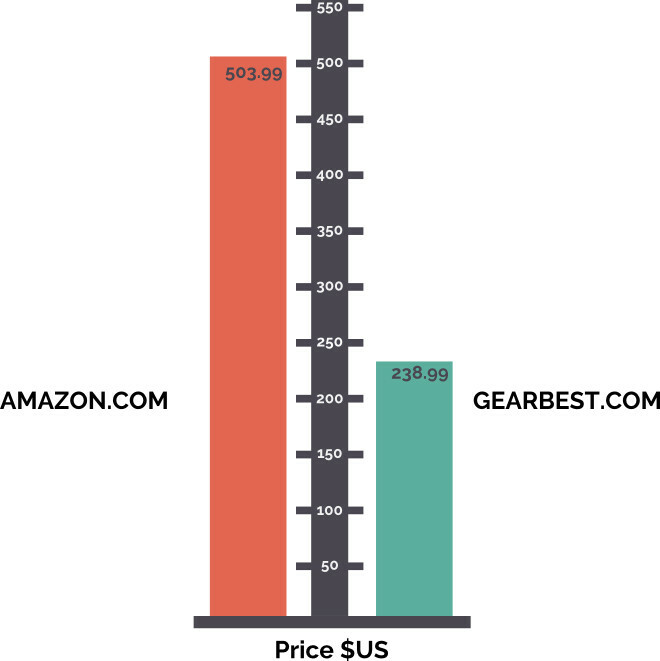 Amazon is listed on the left and Gear Best on the right. Note: Prices, reviews and questions change regularly. In fact daily when I was creating the charts. They are for a visual reference only, please visit the individual site for up to date information. A real entry level hobbyist radio control car. For the price it is great value. Although it’s only 2WD this rc car is still quite capable in the dirt. For the really inexperienced driver it will probably push in the front when turning on loose ground. Rated at a top speed of 30 mph it is certainly fast enough to even keep some experienced drivers entertained. Fitted with a brushed 390 motor, it puts out more than enough power for the beginner. The biggest limiting factor is the battery run time – max. 10 minutes, less if the driver is heavy on the gas. It would be recommended to upgrade to a Ni-MH 8 cell 9.6V 1800mAh battery. This would increase runs times to 20+ minutes. Battery charge time on standard battery is one hour. Having independent suspension is also a great asset, giving the car more stability over rough ground. Motor drive gears and driveshafts are steel, so are the driveshaft end cups. Transmitter is 2.4GHz, requires 2 x AA batteries and is left or right handed. Fully charged the transmitter gives a range of 80 meters or 250 feet. Simple to operate with four functions Left/Right turning and Forward/Reverse. Due to this radio control car being in the hobbyist level many of the parts are replaceable/upgradable. 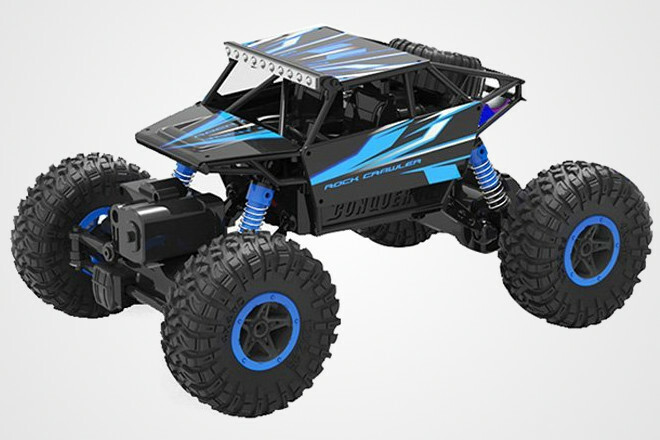 As an entry level radio control car this crawler is ideal for children (6+, although it is stated 8+) or even adults just wanting to learn the basics. It’s not to fast, can maneuver through varying types of terrain and is easy to control. Left/Right turning and Forward/Reverse. There is a trim adjuster if the car wont drive in a straight line. Components are rated splash proof not waterproof. Being an entry level (toy car not hobby car) most parts are not replaceable. That being said, if you watch this video you will get a good a idea of what this radio controlled crawler is capable of. Run time on fully charged battery is about 15 minutes depending on the terrain being driven on. Shorter if doing a lot of climbing, longer if on flat pavement. A battery charger is supplied. Depending on where you intend to buy from just check power and plug compatibility. 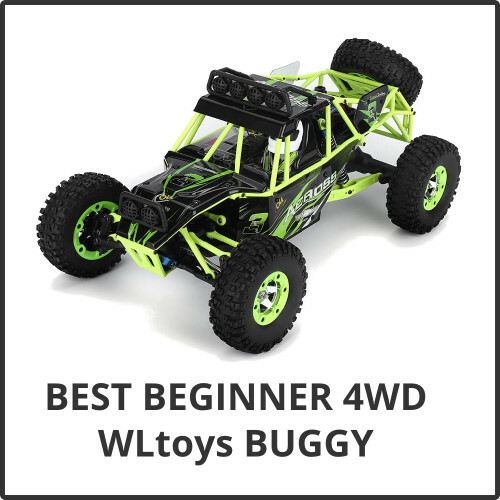 If you have had enough of playing with toy radio control cars and want to take the next step up in to hobby level RC Cars but you’re not quite ready for the price step, then this 1:12 scale off road buggy by WLToys fills that in-between spot perfectly. As an entry level hobby grade radio control car it has some features that are often found on more expensive brand name models. A couple of examples are… the motor, it’s a 540 brushed. Normally this sized motor is found in 1:10 scale cars. Brushed 390 is common for 1:12 scale car like this one. Steel driveshafts and couplers, often these are nylon plastic. On the box it states that this buggy is waterproof and there are videos on YouTube showing it going through water. Realistically, it would be water resistant at best. Keep the electronics dry. The spare wheel mounted on the back is in fact just that – a spare wheel. If you damage one of the ones one the buggy it can be replaced with the spare. It appears that there is two types of transmitter that get supplied in the box, which one you receive is unknown. One takes 3 AAA batteries while the other takes 4. My best guess for this is that they maybe region specific. Example, the USA and Canada get one type, Europe the other. Transmitter range is 100+ meters. Run time is 10+ minutes depending on terrain and speed. The cars rechargble battery is 7.4V 1500mAh, which accounts for the short run time. Do a little research for other batteries like a 7.4V 2200mAh and check dimensions for fit. Many of the parts are replaceable and up-gradable to alloy. Search for WLToys 12428 parts and you will find a list of parts sellers. Contact the Seller for Warranty Info. Popularity of radio control construction equipment has been on the rise over the past few years. If you thought driving a radio control car was a little difficult, then operating an excavator is going to really test your hand to eye coordination. Sitting at 1:16 scale this rc excavator is not small. Operated by a 6 channel 2.4GHz transmitter with 17 functions, keeping this excavator moving smoothly is a game of serious thumb control. The machine itself is powered by a rechargeable battery. Depending on where you purchase there is two different battery capacity sizes. Amazon offer the machine with 2 x 4.8V 800mAh batteries, while Gear Best is offered with 1 x 4.8V 380mAh battery. Run time on the 380mAh battery is about 30 minutes so run time with the 800mAh battery will be double. Battery recharging is via USB cable so be aware that recharge times are going to be long, somewhere around 5+ hours. 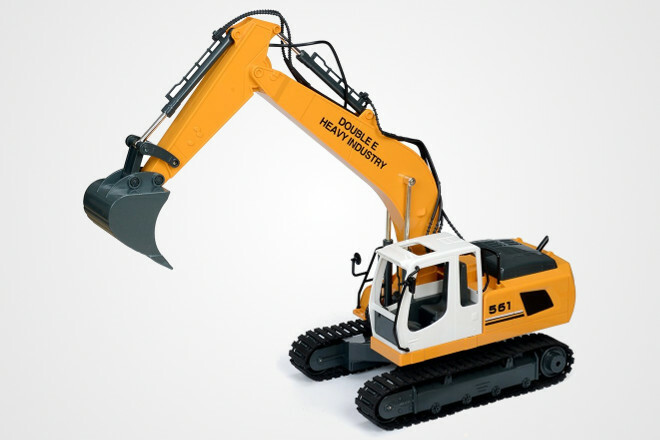 This radio controlled excavator comes supplied with one bucket and one breaker attachment. A grapple attachment is available at extra cost. You maybe thinking this is the same radio control car as the WLToys 12428 mentioned above. And on the most you are right. It took me awhile to find out the differences, because there had to be I thought to justify the price difference. 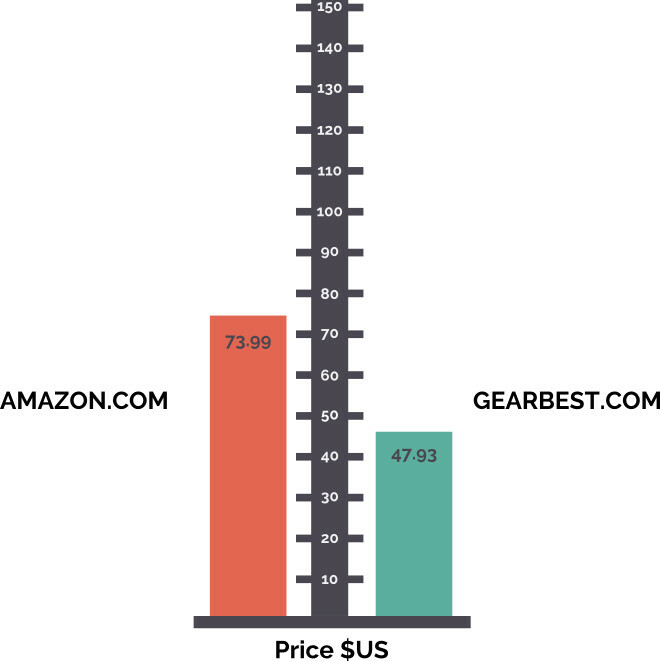 Neither Amazon or Gear Best state any of these differences which kinda indicates the sellers do not know the full specs of the items they sell. Not really surprised. Almost all the upgrade parts interchange between both of these radio control cars. In fact looking over what is fitted to each car you would buy the WLToys 12428 because it has a bigger motor and steel running gear. You can fit a slipper clutch for about $14. Where the price difference possibly is, is in the transmitter. The FY 03 has a few more setting options. Looking like a Traxxas E Revo but for about a quarter of the price. 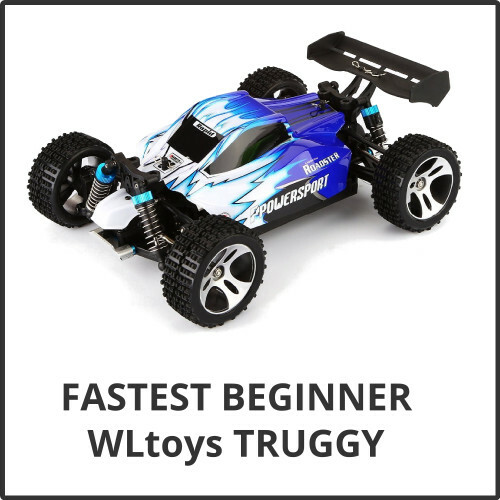 Of course this entry level hobby grade radio control car – truggy – truck is not in the same class as the Traxxas. Sitting at 1:12 scale the stance coupled with those low profile and wide tires gives this rc car a fun mean look. Powerded by a 390 brushed motor running through a 2WD setup keeping this car in a straight line will be a challenge. Using a 2.4 GHz transmitter you have a control distance of 100 meters. Rear driveshafts are metal but unfortunately the drive gears are plastic, which seem to cause a few problems. That being said all the problems related to stripped gears are from Amazon customers. 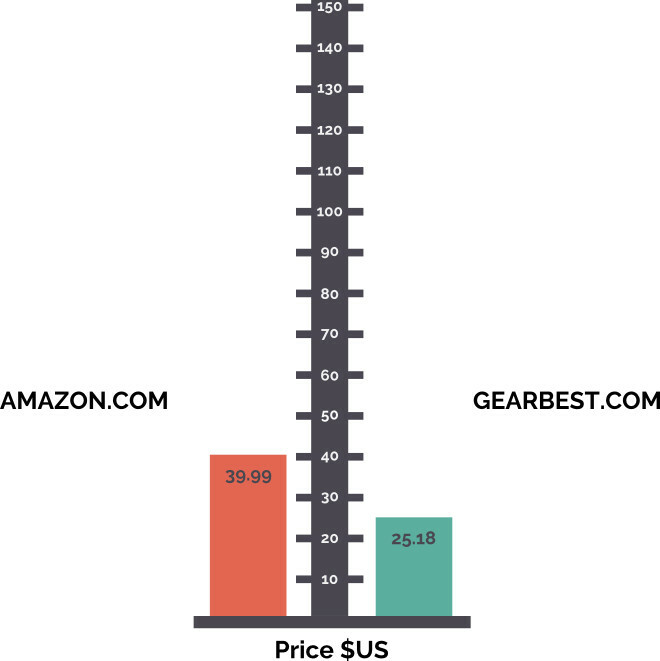 And it is only the Amazon car that comes with a spare set of gears and the battery is 800mAh compared to 700mAh of that supplied by Gear Best. On YouTube there a few videos showing how to replace the gears, however they are plastic too. There does not seem to be a set of metal replacement gears. When everything is running fine the car has an estimated top speed of 50kmh (30mph). Fitted the 700 or 800mAh batteries runtime will be about 10 minutes. This radio controlled car is not waterproof. Light splashing is about all it could take. 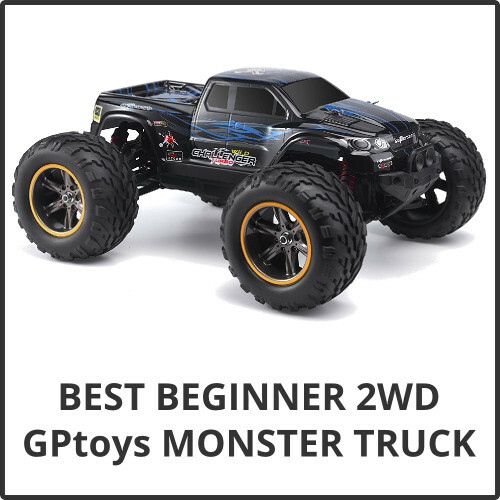 If you have already had some experience with rc cars and want to move up this is a good option but not ideal for someone just starting out. 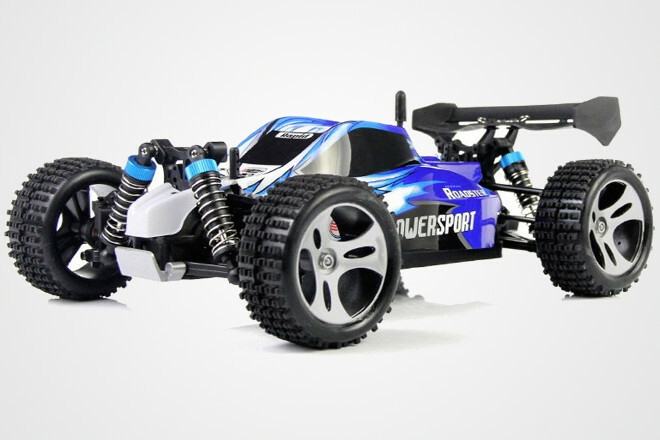 With an overwhelming line up of choice for rc cars on the market, you could probably do better because of the gear problems. Including a motorcycle was just to add variety. 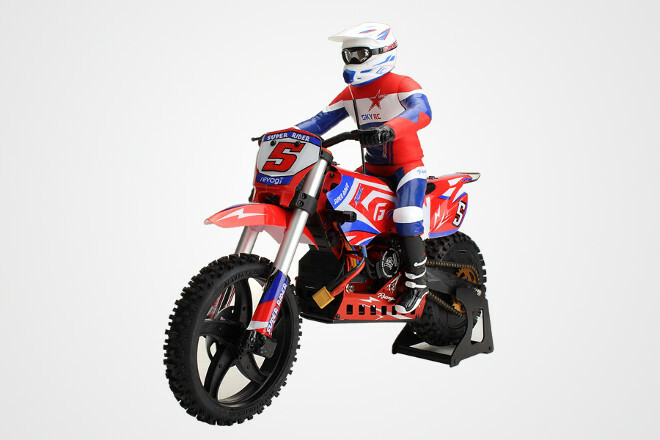 This 1/4 scale SR5 motorcross bike by SKYRC also happens to be the most expensive radio controlled vehicle listed here for comparison. It is also the only one running a 540 3200KV brushless motor drawing power from a NiMH 6S 7.2V 3000mAh battery. Even with all that battery power, runtime is only about 10 minutes. Transmitter is 2.4GHz with a control range of 150 meters. So what keeps the motorcycle upright? Basically it is running a gyro in the back wheel. There are plenty of YouTube videos showing this radio controlled motorcycle in action. For a quick look at it doing some big jumps watch this video. 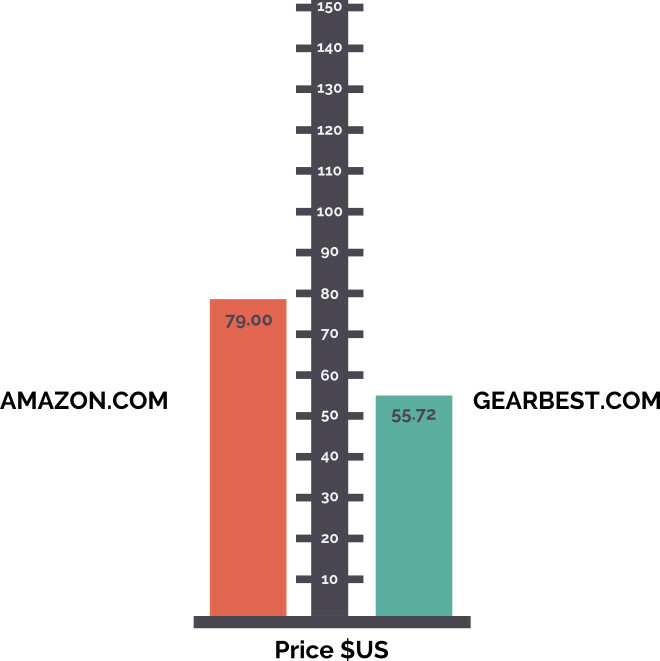 At the time of writing Gear Best has them in stock but the shipping calculator says Cannot ship to…. and any country selected it remains the same. So it could be a page fault. On Amazon the seller states No Battery included. Possibly shipping problems for that seller. 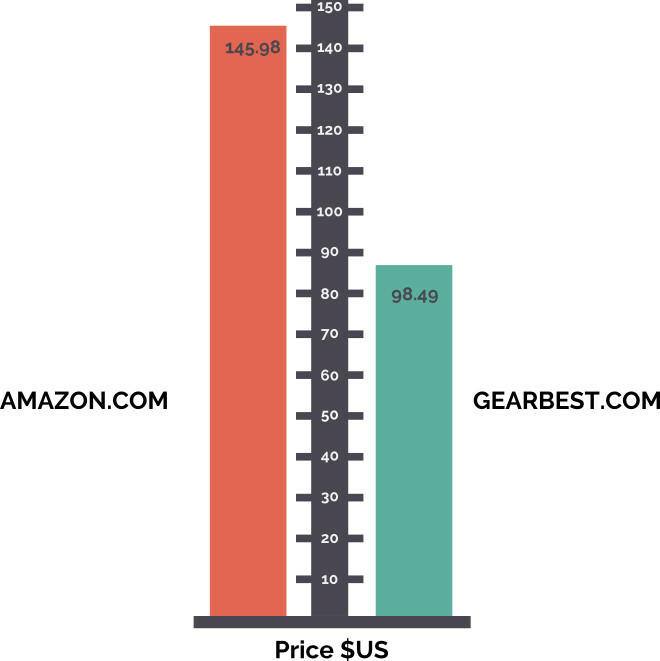 On a brighter note there are plenty of other sellers that have them for similar price as Gear Best. Kids love radio control cars. Problem is there is just so many choices and finding a good one can be a little like trying to find a needle in the haystack. There is toy rc cars and there is hobby grade rc cars. There is also a blurry group where the two kinda get mixed up. And that’s exactly where this 1:20 scale truggy falls into. Priced in the top end toy range but with many features found on entry level hobby cars. It’s quick but not so fast that a child can’t control it or cause major damage to the car if crashed. Power comes from a rechargable battery through a brushed motor and pushes this small car along to speeds of 20+ kmh. The 2.4GHz transmitter has a control range of 50 meters which is ideal for indoor use. Driving outdoors on soft terrain or long grass is possible but battery run time maybe be reduced. While this radio control car is promoted as being waterproof, think of it as more water-resistant. Recharging of the battery is via USB cable, which is the cause of the slow recharge time, 2-3 hours. A wall charger would reduce the time by half. 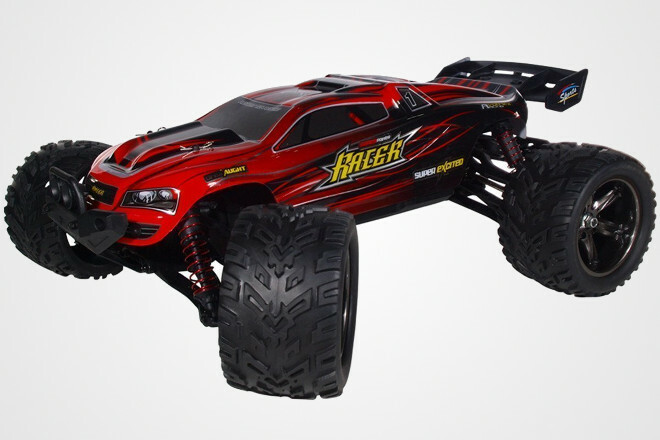 Are you tired of the toy grade RC cars and feel like you want something faster. WLToys A959 is the answer. 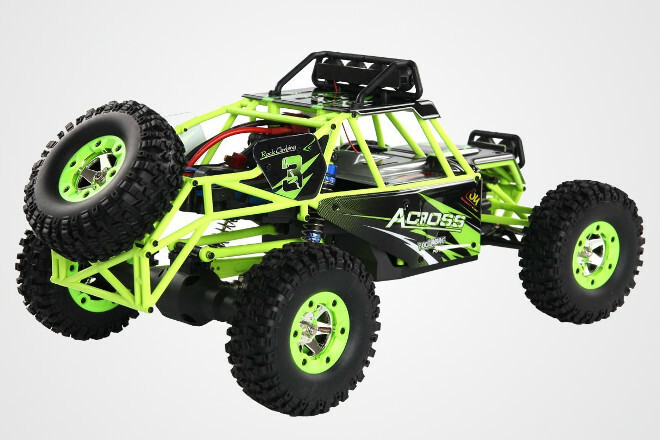 It’s 4WD truggy/buggy powered by a 2S LiPo battery and pushed along by a 390 brushed motor. Run time on the 2S is about 10 minutes (15-20 is stated) and recharge time is about 2.5 hours. 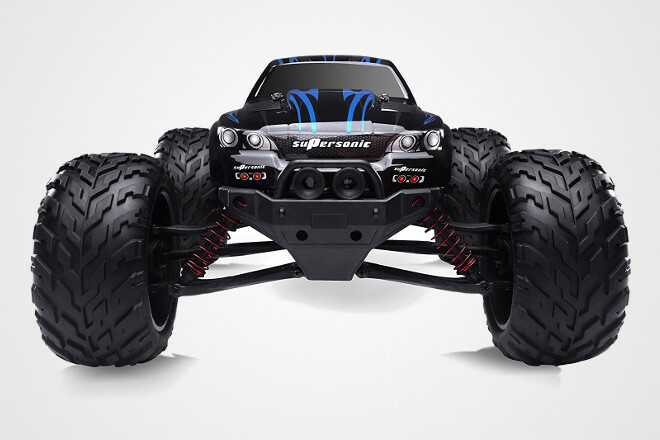 This radio control car can reach speeds of 50kmh/30mph and only being 1:18 scale it’s fast. Those speeds in this size car and you are going to have your work cut out for keeping it in a straight line. Fitted with hollow low profile tires give it traction where needed on flat ground but due to the low ground clearence it may struggle in grass and uneven terrain. A 2.4GHz transmitter sends the control signals to the car up to a distance of 100 meters. Four AA batteries are required for the transmitter. Considering the speeds this rc car can reach, accidents will happen and when they do things break. Replacement and upgrade parts are available. 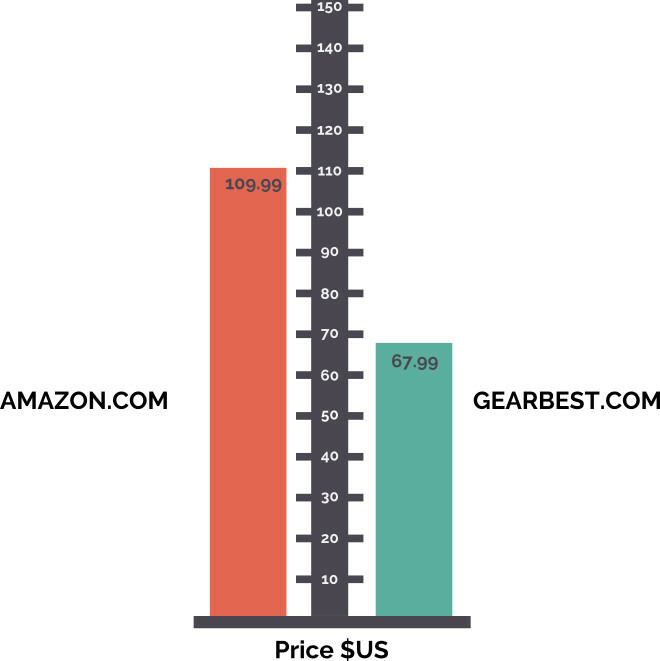 There is a whole host of them on Amazon, Gear Best and Aliexpress. It has been noted that the drive/reduction gear, which is plastic, is one of the first things to break. The upgrade part is metal. 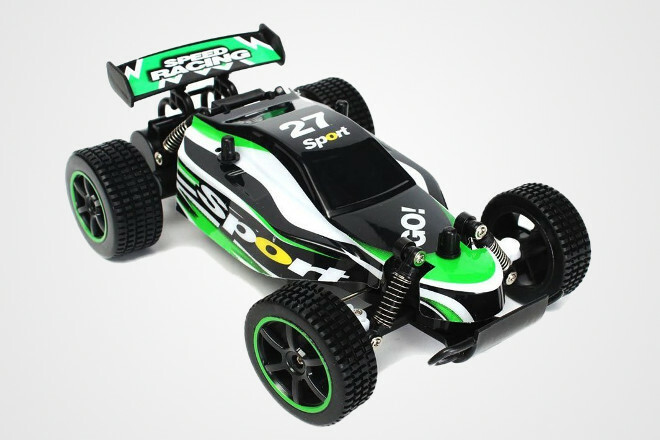 So is this rc car suitable for children – yes, but older children, unless the younger already have good experince with driving radio controlled cars. Radio control Drifting is super popular and including a good drift car in this list was a must. However, finding a good RC drift car for beginners for around a hundred bucks is not an easy task. Amazon have a couple by Exceed Racing which are a good starting point but I knew there was better available for similar money. So even though all the previous cars above had comparisons the drift car highlighted here does not. So what is this car? 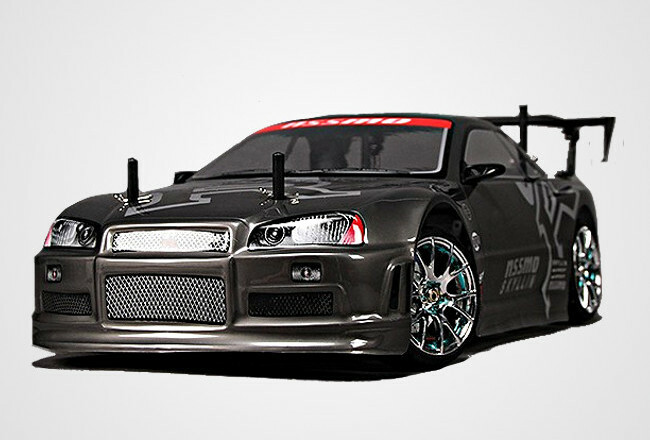 It’s the Mission-D 4WD GTR Drift Car from HobbyKing. As stated on their website this is the best value in RC drift cars on the market today! The Mission-D is set to go right out of the box. But… you will need to add your own radio system (2CH transmitter & receiver) and 2S 7.4V lipoly battery to be ready to drift! These can be purchased from HK as well and the final price is only a little more than the Exceed Racing cars. Yes, this rc drift car is 4WD. Easy to learn drifting with four wheel drive than 2 wheel drive. With 2WD you will spend so much time just going around in circles. Move to 2WD later if you want. Many of the parts are full hobby grade and of course there is plenty of up-grades available.